Most of us know a dog that demands attention. If it’s not our own dog demanding attention it’s a friend’s dog or a daughter’s dog or a neighbor’s dog, right? Dogs demand attention in all sorts of ways such as whining, barking, pawing at us, jumping on us, even biting. So I’m sharing my ideas on how to stop this behavior. As always, I’d love for this to be a collaboration of your ideas as well, so please share your suggestions in the comments. These kinds of topics are so helpful for new dog owners. Do I truly want my dog to stop this behavior? Or do I like that he paws and jumps on me because I view it as affection? The reason I want you to ask yourself these questions is because some people say they want to stop their dog’s jumping or pawing but they truly don’t want the dog to stop. There’s nothing wrong with this (I guess?) as long as the dog is not harming anyone. It’s not how I would want my dog to act because I view it as pushy and demanding, but I realize some people don’t mind. My dog is a big klutz and I can’t have him pushing me around. Like, don’t touch him. Don’t laugh at him. Don’t make eye contact. Don’t grab his collar to keep him off you. Don’t talk to him. Yes, Cesar Millan’s “no touch, no talk, no eye contact” works. If you’re trying to work on something and your dog is whining, just don’t acknowledge him at all. Turn your back to him. Calmly get up and walk away. Pretend to focus on something else. You’ll notice these are actually tactics dogs use with one another. Puppies leave my dog Ace alone because he doesn’t engage with them. 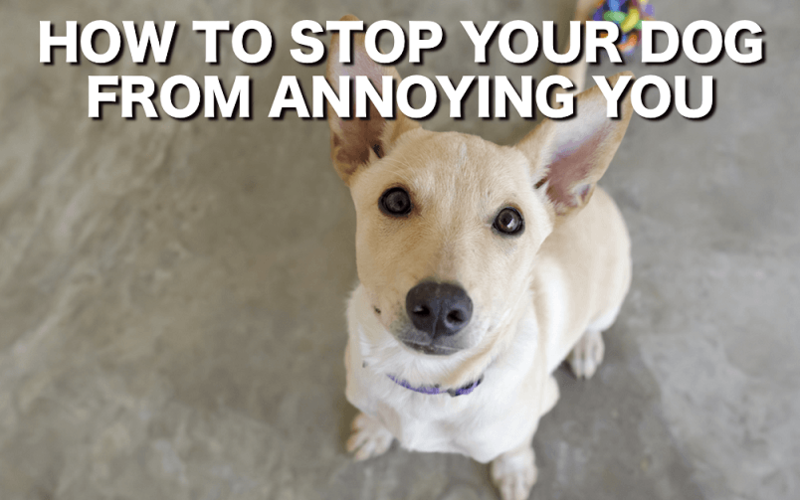 What if ignoring your dog doesn’t seem to be working? I know some dogs won’t be ignored. They’ll start jumping frantically on you or mouthing you. Some will even growl! 1. The battle of willpower. Just keep on ignoring him. 3. Calmly move your dog to another room or to his crate. The key is to do this in a zombie-like, non-emotional way. So, it’s not a punishment and it’s not attention either. Hard to do! 4. Have some chew toys set aside so you can bring them out for your dog in these scenarios. 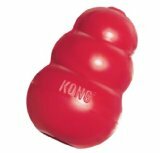 Things like a Kong toy, other puzzle toys, a bully stick, etc. Don’t worry you’re “rewarding” your dog for bad behavior by bringing out these toys. Instead, you can ask him to sit or lie down first and give the toy for that behavior. 5. If all else fails, I like recommending the Pet Corrector. It shoots a harmless blast of air at the dog. You’d want to deliver a quick, precise “correction” with it. Another option is to use a squirt bottle with water to correct your dog, however many will make a game out of this. 6. Finally, it helps to keep some dogs on a leash in the house much of the time while they’re still learning manners. That way you have more control. You can put the dog in a down position and step on the leash if needed or tether the leash to yourself or nearby. 7. And one more thing because I have to say this in every post … EXERCISE. Get out for walks, run, go to the dog park, buy a dog backpack, etc. So those are my tips. well I have to say that mu dog Okami does this. 1 I have to go out and go potty (starts with paw on chair, then snout in ribs, then she starts barking at me if I am too slow. 2 I am thirsty and my water bowl is empty. I will say the one of those behaviors that in some ways I don’t want to stop is the first one because I would rather she let me know she really needs to go out, rather than making a mess in the house. on the other hand it could be (likely is) an indication that at least some of the time I really don’t pay as much attention to her as I really ought to. I just wanted to let everyone out there in on something that we used to use at the neighborhood shelter. My husband and I made these “Feed Tubes” for the higher energy dogs at the shelter. They worked wonders for the dogs that were going stir crazy in their kennels from not enough exercise or stimulation. You take a 2″-3″ (or smaller diameter for small dogs) PVC Pipe, cut it about a foot long and drill holes along the length of the tube except for about 1 1/2″ at each end. This will let the dog food fall out, you only want maybe a dozen holes. You don’t want the holes too big otherwise the food just falls out with no work. Put caps on the end of the tube, gluing ONLY one in place. Fill the tube with the normal amount of food that you give to your dog, put the cap on snug. Place the tube on the ground and roll around a few times to get you dog interested and show him/her what to do. Let them go to town, it may take a few times for them to get the idea, others only once! This really works wonders on the behaviorally challenged! It also works great for those dogs like mine that were puppy mill puppies that bolt their food. Maggie used her feeding tube for about three months. She loved it! I had the hardest time trying to get her to slow down her eating. This Feed Tube worked wonders. Hope this helps. My dogs are so pushy. Sometimes it’s cute, sometimes it’s annoying. It’s my own fault, for reinforcing SOME of their pushy behaviors.